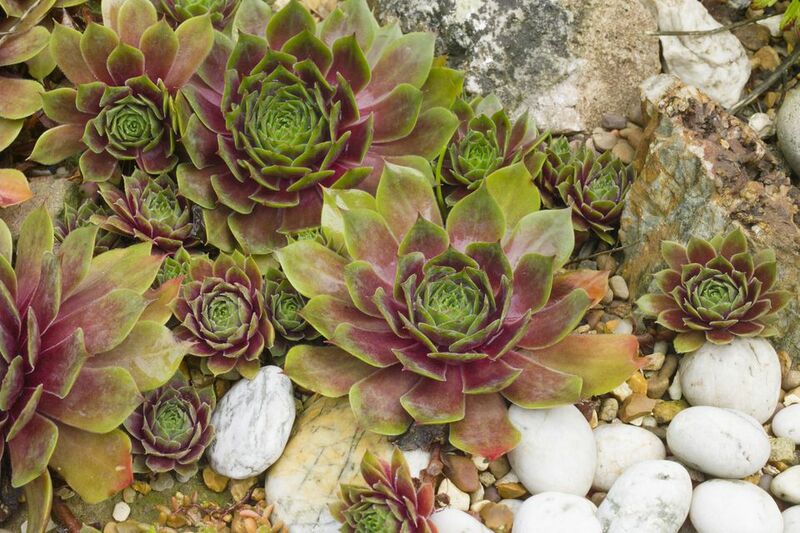 Hens and Chicks (Sempervivum tectorum) are low growing evergreen succulent plants that look a little like rubbery roses. They are considered alpine or rock garden plants, because of their hardiness and drought resistance. The original rosette, the ‘Hen’ produces tiny rosette offsets that are known as the ‘Chicks’. The name Sempervivium is Latin for “live forever”. They don’t really live forever, but since they produce so many ‘chicks’ or plantlets, they seem to last forever. Plus, they remain evergreen throughout the year, even in cold climates. Hens and Chicks are also tough, drought-resistant plants. Leaves: Thick, fleshy pads arranged in 3 to 4-inch rosettes. The leaves are usually pointed and some have purple tips. There are varieties with green leaves and shades of red. Flowers: Mature plants produce an odd looking thick flower stalk with star-shaped flowers at the tip of mauve-pink or red. The flower stalk extends 8 to 12 inches before blooming. Once the plant blooms, the mother plant dies. Hens and Chicks are widely adaptable and will be reliably perennial in USDA Hardiness Zones 3 - 11. Full sun to partial shade. Hens and Chicks prefer a spot in full sun but will appreciate some afternoon shade, in extremely hot climates. Hens and Chicks are not grown for their flowers, but when they do, it is usually during summer. There are hundreds of varieties, but you’ll probably need to go to a specialty nursery or catalog to find most of them. Most nurseries simply sell the common Hens and Chicks. Sempervivum tectorum ‘Boissieri’ - Bronze tinged leaves rusty tips. Sempervivum tectorum ‘Sunset’ - Bright green leaves with shades of red and orange. Sempervivum tectorum ‘Oddity’ - Bright green leaves with quilled edges and black tips. Sempervivum arachnoideum (Cobweb houseleek) - Related species with white threads, like a web, across the rosette. You can use Hens and Chicks in the garden, but they can get lost. Planting a large patch or using them along edges will help them stand out. Planting them in a pot and raising it off the ground will make them more or a feature. A classic way to feather them is in strawberry pots, although you’ll need to divide them as they outgrow the pot. They are also a natural with hypertufa planters or any kind of stone container. If you have a rock garden or rock wall, you have the perfect environment for growing Hens and Chicks. Tuck them into the crevices or let them drape over a rock wall. Stone provides the perfect balance of drainage, radiant heat, and root protection. Another option is mixing Hens and Chicks with creeping sedum, to make a nice lawn alternative in no traffic areas. Soil: Hens and Chicks, as with most succulents, need excellent drainage. Poor, sandy soil would be just fine. You could work some peat into heavier soil, to lighten it and improve drainage. Soil pH should be in the neutral range, 6.6 to 7.5. Planting Hens and Chicks: Hens and Chicks can be grown from seeds, seedlings or by dividing offsets. Don’t plant your Hens and Chicks too deeply. Dig a shallow hole and spread the roots. Cover to the crown of the plant and tamp the soil gently so that the plant is firm in the ground. Water lightly, but you don’t need to water newly planted Hens and Chicks every day, the way you would with non-succulents. Hens and Chicks need to let their roots dry out between waterings. Growing Hens and Chicks from Seed: Seeds can be sprinkled on top of a soil or gravel mix and kept moderately moist until they germinate. Once they sprout, sprinkle some fine gravel around them as mulch. Seeds are usually started in pots and then transferred to the garden as seedlings. You can start your seeds in the fall and transplant in the spring. Dividing Hens and Chicks: Hens and Chicks will spread by underground roots. During the growing season, expect each plant multiplies itself by at last 4, by producing little offset plantlets all around the perimeter of the ‘Hen’. These are the ‘Chicks’. The Chicks can be snapped off and replanted elsewhere at any time. Once established, maintenance of hens and chicks is minimal. You’ll need to remove the old hens, after they flower, and divide chicks as needed. Except in extremely hot, dry situations, you won’t even need to give them supplemental water. No fertilizer is needed. Hens and Chicks usually grow problem free, unless they are exposed to too much moisture. Crown rot will occur in wet soils. Some varieties can get Endophyllum rust, a fungus disease. Both problems can be prevented if grown in dry conditions.